Morgan Smith Goodwin has been starring in Wendy’s commercials for more than two years now. She’s quite cute and perky. I like Wendy’s and the Pretzel Bacon Cheeseburger sounds really good. But man. This is quite irritating, and it’s been playing all the time. The song is based off “To Be With You” by Mr. Big. I’ve been writing a lot of positive posts lately, so it’s time for something a little more negatory. Now, everyone seems to like Morgan Smith Goodwin, the Wendy’s redhead. But this new-ish commercial for Wendy’s Premium Cod Sandwich is just embarrassing. The rapping and dancing are so awkward. I know it’s probably awkward on purpose, but still. Blahh. I guess for that reason, Wendy’s made another version minus the rapping and dancing. It’s more acceptable. 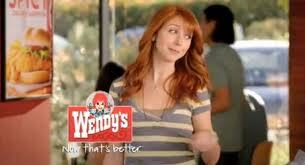 Everyone’s favorite fast food slinging spokeswoman, Morgan Smith Goodwin, is back in yet another Wendy’s commercial. I’m a fan of Wendy’s, but definitely not of mushrooms, so I think I’ll skip the Bacon Portabella Melt. Here’s a review from GrubGrade. Filed under Uncategorized Tagged with Bacon Portabella Melt, GrubGrade, Morgan Smith Goodwin, Now That's Better, Wendy's, Who is that hot ad girl? Really, there’s not much interesting about this new Wendy’s commercial. But people love the redhead, Morgan Smith Goodwin, so I suppose it’s post-worthy. The Asiago Ranch Chicken Club looks like Wendy’s is trying to get more sophisticated with foodie-type items (“It’s way better than fast food. It’s Wendy’s.”) And it seems like many fast food places are also trying to class it up, with more competition from “fast casual” restaurants. Morgan Smith Goodwin, everyone’s new favorite fast food spokeswoman, is back in a commercial for Wendy’s Berry Almond Chicken Salad. She is reliably redheaded, cute, and perky. The woman she’s helping is played by Dixie Perkinson. As for the salad, it looks tasty and summery (most Wendy’s products are high-quality), but fast food salads still strike me as a little strange. It’s good to have healthier choices, but in the times I’ve been at fast food places, I’ve rarely seen them ordered. The price points are also high…$6.49 for a salad?